This chronicle deals with the house of God on earth. 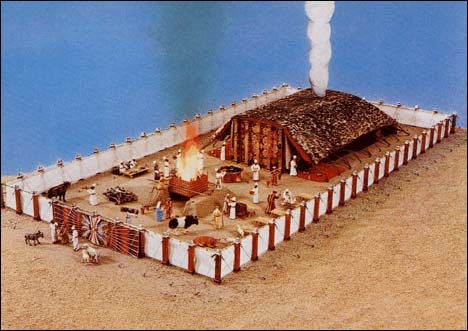 With His Old Testament people, Israel, it was the temple in Jerusalem. With His New Testament people, the church, it is assemblies of believers in every place that call upon the Name of Jesus Christ our Lord. To help understand the importance of God’s house to Himself, we first want to look at His principles in His Old Testament house and then in the New Testament house. For while the methods of God change from the old to the new, His character and principles of truth do not. Both in the Old and New Testaments, God’s dwelling place among His redeemed people involved two elements. 1. Something they are in that is a gift. 2. A place in which to come together where the Lord has chosen to put His Name (presence and authority). 1. "In the Land." In Deuteronomy 12 God gave Israel instructions when they would come "in the land, which the Lord God of thy fathers giveth thee to possess it." The promised land is something they would find themselves in and the Scriptures consistently express that this land was given to them as a gift from God. There is a set of instructions concerning the terms of the land and their behavior in it. 2. "Unto the Place." God also gave a second set of instructions. This set involved a place within the land. Once they were in the land of their inheritance they were to come "unto the place which the LORD your God shall choose out of all your tribes to put his name there, even unto his habitation shall ye seek, and thither thou shalt come: And thither shall ye bring your offerings and sacrifices … ." e. It was where God put His Name (Lord – Jehovah). Since He put His Name there, only He has authority there, never man’s traditions (When one comes "in the name of the law," he means the authority of law). While instruction concerning the land are numerous and very important for the people’s welfare, instruction concerning the place where God resides is equally important. In these chronicles of the church we want to focus on the place of God’s dwelling on earth. In Deuteronomy 12-31 there are a series of instructions concerning the place of God’s dwelling. They reveal the nature of the house of God that make it pleasing to the One who resides there. Following are some things that characterize "the place." The old covenant with its temple in its chosen place of Jerusalem is no longer here. If God lives on earth today, where does He live? And may we there expect to find His same principles of truth? The New Testament reveals that believing Jews and Gentiles equally "are builded together for an habitation of God through the Spirit": the church (Eph. 2:21,22). For example, take the name ‘Smith family.’ If you say, "this is the ‘Smith family’ tree," you mean the whole clan of Smiths, living and dead from the beginning to now. If you say, "I’m going to the ‘Smith family’ reunion," you mean all the living Smiths in the present. If you point out a house and say, "the ‘Smith family’ lives there," you mean one family unit (that will have authority, rules and order to it). If you say, "the ‘Smith family’ is in Congress," you likely mean one member of the Smiths who represents the name as a whole. Sometimes in Scripture the word temple or church (called out company – assembly) refers to the body of Christ as a whole. All from Pentecost to Rapture who placed saving faith in the Lord Jesus Christ were baptized with the Spirit into Jesus Christ and form His spiritual body. All in Christ’s body share equally in the same spiritual blessings and inheritance. Sometimes in Scripture the word church simply means all Christians in general living in the world. Sometimes in Scripture the word church refers to a specific congregation of believers who habitually assemble in a place. Here there is an order and protocol. It has a specific function and ministry in being a lampstand of testimony unto Christ for God. Here the word body is added, now referring to every individual believer. Since the Spirit personally indwells the heart of every believer, one is to behave as the holy temple of God seven days a week, twenty four hours a day regardless of their physical location. As in the OT, the people were first in something and then came to the place where God’s Name was and there offered to God, so also in the NT. Observe an opening remark in the first letter to the local Corinthian church. In Christ Jesus. Firstly, believers are in Christ Jesus. They have been set apart from the world by God and placed with the Holy Spirit into a union with His Son. This is the effect of God’s salvation. All believers are now constituted as the sons of God and the body of the Lord Jesus. This brings the believer into all the blessings of Jesus Christ Himself, for when one is in a union (head and body), he shares in all things. As the land was the gift of God to Israel so Christ’s salvation is a gift of God. A gift is not by works (Eph. 2:8,9). One is in Christ by the grace of God alone. One could not come to the place until he was first in the land. One must first be in Christ before he partakes in the church. In every place. In the Corinthian epistle God does not say everyone but "every place." Here He has in mind the corporate assembly of believers: the local church. In the NT gospel, it is not one national central headquarters of gathering but every place worldwide. Now, every place is not any place. What makes the "place" a living temple for God’s presence is that there, believers call upon the Name of Jesus Christ as Lord. It is upon Jesus alone that the Lord has put His Name: Lord (Philp. 2:6-11). When a local gathering of believers recognizes the risen authority of the Lord Jesus alone, they constitute a NT temple (assembly) of God. A local church is viewed as those in Christ Jesus (saints) who in a given community habitually come together in one place and call upon the Name of the Lord Jesus Christ. "In the Name of our Lord Jesus Christ, when ye are gathered together" (1Cor. 5:4). Coming together in the church is defined as "When ye come together therefore into one place" (1Cor. 11:18,20), and "If therefore the whole church be come together into one place" (1Cor. 14:23). The geographical place is not the church or sanctuary but the saints who are gathered in that place calling upon the Name of the Lord Jesus. There is much teaching today on being in the land, i.e. in Christ: the terms of His gospel, its benefits for us, how to walk, enjoying spiritual fruit in our lives, and family values. If based on Scripture this is good. Yet there seems to be a neglect in ministry on the church as it gathers in one place. Because this is God’s portion, we see it necessary to emphasize such. It is true one can worship God in his heart in a private setting. However, God puts an emphasis on corporate worship and service. Yes, there is a cost to getting there and putting up with people’s idiosyncrasies. But worship is sacrificial and has "feet" to it. Israel was to seek and come with their sacrificial offerings to the place where God put His Name (Deu. 12:5,6). King David said he would not offer to the Lord that which cost him nothing (1Chron. 21:24). A sports team is elated when fans pack the stadium to cheer its team. So also as believers of different races and classes assemble to glorify God in Christ with one mind and one mouth, the power of God’s gospel is seen (Rom. 15:6). One should not say in God’s house, "I didn’t get anything" but rather, "did I give anything to Him?" The house of God is His. Therefore, it functions for His pleasure, just like your house is designed to your liking. The church is not for man primarily. If one thinks the purpose of assembling together is for the unsaved, he will be tempted to turn it into a mission that’s "seeker sensitive," to make the unbeliever feel comfortable, and not offended. If one believes the assembling together is essentially for the needs of believers, he will be tempted to make it "user friendly," a "happy-hour" for believers. But, if one realizes the assembly is for God, he will make sure that God is not offended and is delighted according to His Word.